Thomas the Tank Engine and his sodor train friends products. Thomas the Tank Engine and his friends are here to make your child's train party even more spectacular. If your child likes Thomas then load up on some fun with our great selection of Thomas & Friends merchandise. We carry Thomas the train party supply, Thomas party favor, printed latex and mylar (foil) balloons, Thomas & Friends pinatas, tableware, greeting cards, Thomas posters, games, puzzles, toys and gifts. 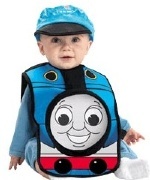 We are your one stop source for Thomas & Friends items. All aboard for a party with Thomas the Tank Engine train and all his railroad friends. Need Thomas the train cake topper and decoration items? Please visit our Cake Pans & Decor section for Thomas cake related itmes.